Thomas Bryant scored a team-high 19 points as Indiana took down Kentucky in Saturday’s second-round rivalry game. In a matchup between two power-conference champions and bitter rivals that share a state border, No. 5 seed Indiana beat No. 4 Kentucky, 73–67 on Saturday. Freshman center Thomas Bryant scored a team-high 19 points, including four free throws in the final minute, while senior point guard Yogi Ferrell added 18. Kentucky’s backcourt combination of Tyler Ulis and Jamal Murray—maybe the best in the country—scored 43 of Kentucky’s 67 points, led by Ulis’s game-high 27. But the Wildcats’ starting lineup dealt with foul trouble and their frontcourt couldn’t match the high-energy play of Bryant and Troy Williams. Kentucky jumped out to a 9–2 lead but Indiana went into halftime with a 33–32 lead, despite shooting 3 of 11 from three in the half and the Wildcats holding a plus-five advantage on the boards. Despite three of its players—Robert Johnson, Juwan Morgan and OG Anunoby—leaving the game with injuries, Indiana shot 13 of 24 from the field in the second half and repeatedly got to the free throw line down the stretch. It was Indiana’s first NCAA tournament win against Kentucky since March 17, 1973, and the Hoosiers earned their third Sweet 16 appearance in five seasons. It had been 1,457 days since Indiana and Kentucky last met on the basketball court. The Wildcats defeated the Hoosiers in the Sweet 16 of the 2012 NCAA tournament and the teams hadn’t played since. With a Sweet 16 appearance on the line, the two programs with a combined 13 national championships met in Des Moines, Iowa, where Kentucky’s season ended and Indiana’s extended as it pursues another title. It was Kentucky coach John Calipari’s earliest NCAA tournament exit since 2004, while Indiana coach Tom Crean, the subject of frequent hot seat discussions, takes his team to the second weekend for the first time since 2013. 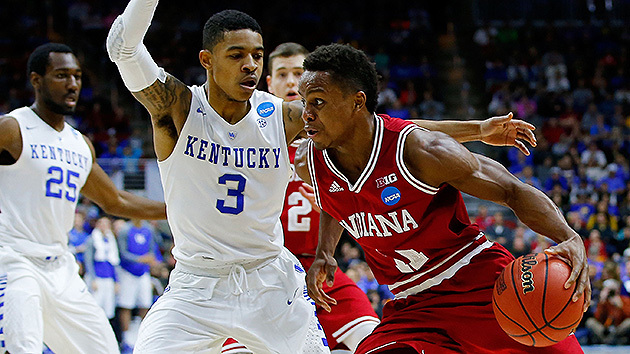 Saturday also featured a game within a game: a matchup between two All-American point guards in Indiana’s Yogi Ferrell and Kentucky’s Tyler Ulis. There may not be a better individual matchup in the NCAA tournament and the two diminutive point guards did not disappoint, combining for 45 points and seven assists. The two schools have been unable to reach a new agreement to restore their once-annual non-conference series, but the Selection Committee set up an exciting second-round matchup in Des Moines. Under normal circumstances, an NCAA tournament game between two power conference champions wouldn’t take place in the second round. However, the two blueblood programs were placed in the same pod as the East Region’s No. 4 and No. 5 seeds. Kentucky’s season ends in the second round. Alex Poythress played his final game on Saturday and Kentucky’s backcourt of Ulis and Murray could both be on an NBA roster next season. Meanwhile, Indiana moves on to face the winner of Saturday night’s No. 1 North Carolina-No. 9 Providence game. The Hoosiers will look to recover from their physical game against Kentucky in an effort to advance past the Sweet 16 for the first time since 2002.